Lindsay Park Racing is seeking experienced Track riders to join the team at our main training complex at Euroa. We are seeking passionate, experienced and reliable people who have the ability to work well within a team and individually to join one of the country’s leading stables riding the highest quality racehorses. You will be required to ride track work six mornings per week and alternate Sundays to educate young and mature horses in full work, together with some stablehand duties. This position attracts a generous and above Award rate of pay, which is commensurate with your skill set and experience, along with excellent working conditions, on-site accommodation and a staff canteen. The positions are available immediately. CLICK HERE to download the Job Description. If you believe you are the right candidate for the role, please send a covering letter and CV to Susan Mills, HR Manager at employment@lindsaypark.com.au. If you think you have what it takes to join Lindsay Park Racing, please see below a list of on-going race side employment opportunities within the stable with their relevant Job Descriptions. We offer a variety of positions and terms of employment at Euroa, Flemington & Adelaide. Lindsay Park Racing is seeking experienced horsemen/women to join the team at Lindsay Park Racing’s, Randwick Stables in Sydney. Working for one of the country's leading race horse training operations, we seek dedicated, industry experienced and reliable individuals who can work both individually and within a team. Track riders will be required to ride both slow and fast timed track work. These positions are available immediately to the right candidates and attract a generous and above award rate of pay, commensurate with your skill set and experience. Some flexibility with terms of employment which can be either Casual or Full Time. Please CLICK HERE to download an Application Form and send together with your CV, a covering letter and at least two current work references to Susan Mills, HR Manager at employment@lindsaypark.com.au, referencing the position and location you are interested in. Do you have a minimum of two years’ experience working as a stable hand in a thoroughbred racing stable or the like? Do you have minimum two years’ experience riding track work in a thoroughbred racing stable, either slow or fast work? 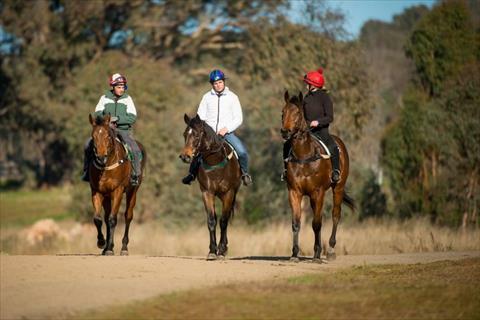 Lindsay Park Racing is now seeking an experienced rider to join our Breaker Team at our Euroa facility for the season of 2019. At this elite level, the horsemanship skills are foremost in the role. Your calm nature, well developed knowledge, ability to work in a small team, minimum of 5 years’ experience in the racing industry as well as developed health and safety obligations will assist you to stand out from the rest and handle some of the best-bred young horses in the industry. • Prerequisite is to have experience breaking -in. This position offers a 6-month Contract with a handsome salary package, which can be negotiated based on your qualifications and experience. You will work a single morning shift, Monday to Saturday and alternate Sundays for the period of the contract. At the expiration of the Contract, an extension or further Contract on race side of business will be considered. This position is also open to international staff who hold a sub-class 417 or 462 Working Holiday Visa. Accommodation could be provided to suitable applicants. Dependent upon your skills set, the role could be extended or become permanent. If you believe you meet the desired requirements needed to fulfil this role, Apply Now by emailing your resume and cover letter to susan@lindsaypark.com.au. For any queries contact Christine Encke or Kylie Deane on 03 57 368500.